To buoy growth amidst competition, companies operating in the global large format display market are experimenting with diverse strategies. Besides investing in the development of novel technologies, spending allocated to marketing campaigns has increased significantly over the last few years. These strategies are popular among market players looking to gain a competitive edge, finds Transparency Market Research (TMR) in a new study. In addition, the global large format display market has witnessed several collaborations over the recent past, aimed at expanding footprint across emerging nations. According to TMR, Barco NV, NEC Corporation, LG Display Co., Ltd., Samsung Electronics Co., Ltd., Sharp Corp., Sony Corp., TPV Technology Ltd., Leyard Optoelectronic Co., Ltd., Au Optronics Corp., and View Sonic Corporation are some of the most prominent companies operating in the global large format display market. The global large format display market is predicted to value US$14,716.2 mn by the end of 2025, as against US$8,730.5 mn in 2016. Considering the past and forecast figures hold true, the global large format display market will report a CAGR of 6.1% between 2017 and 2025. The large scale installation of advanced large for displays such as OLED and fine-pixel LED across various sectors has catapulted North America to the global market’s fore. According to TMR, Europe will also offer lucrative growth prospects to the large format display market. However, during the course of between 2017 and 2025, the Asia Pacific market is likely to report the highest CAGR of 8.0%. Based on end user, the retail segment accounted for the leading share of 23.6% in 2016. The rising demand for quality and affordable display technologies has played a key role in accelerating the pace of gains in the global large format display market. Besides the soaring outdoor applications, the increasing use of large format displays indoor will bolster prospects for the market’s expansion in the coming years. 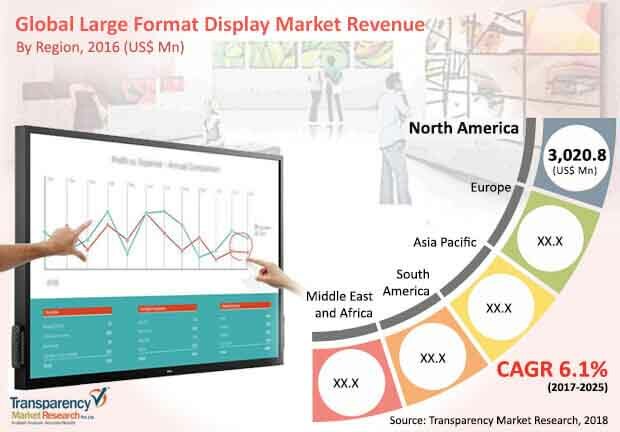 Primarily, the global large format display market will continue benefiting from the rising demand for commercial video walls based on LCD and LED technologies. Also, the recent innovations in display technologies will bode well for the overall market. For instance, the advent of the direct-view fine pixel LED video walls have revolutionized the large format display market, enabling it exhibiting robust growth in the coming years. The demand for these displays is likely to increase as they are offer high quality resolution and are highly bright. Furthermore, they can be used for constructing seamless video walls. In addition, the demand for narrow bezel LCD and large-pixel LEDs are likely to increase. On the flipside the demand for LCD standalone displays will decelerate over the forecast period. Nonetheless, the market will continue exhibiting a strong growth on the back of advancements in technologies. The outdoor application of large format display is likely to remain high in the coming years as the world witnesses an increasing number of sporting and other events. As per various studies, entertainment and sports will offer lucrative prospects to large format display market. Despite witnessing favorable trends, the rising online advertisements and increasing deployment screen-less displays, projectors, and other wide screen alternatives will restrain the market’s growth to an extent.